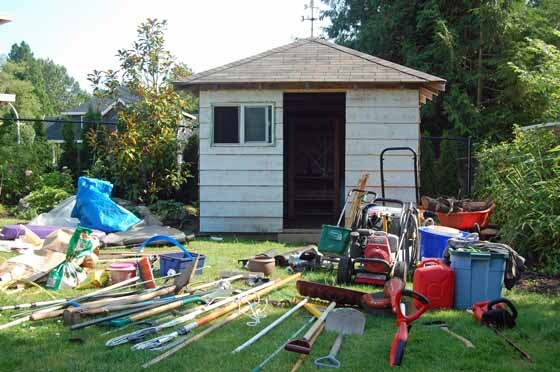 Yesterday, I have finally got some time to start organizing my garden shed. I finished building my shed late last fall and as the weather turned nasty and I did not have a lot of time to get it organized and I just dumped everything inside. A lot of the stuff was under tarps and it was nice to get it inside and out of the elements. This included garden tools, garden supplies, wood and everything else I had no other place to store. As you can see from the picture below it was pretty messy. Everytime I walked into the shed I didn’t like the clutter and I thought there is no way everything will fit into my new 10×10 storage shed. Also, I was not looking forward to cleaning it up and getting it organized. It looked like a big job and I had lots of other things to work on. Then my neighbour offered me an old kitchen counter that I could use for a potting bench. It had drawers, shelves and it would fit perfectly under the window in the shed. And it gave me the motivation to get it organized. Organize every thing in different groups; gardening tools, powered tools and trimmers, gardening supplies, etc. I took some time and thought about how I was going to use my shed and the best way to put everything back into the shed. It was really nice having everything out of the shed and on the lawn because I could organize my thoughts and not be influenced by how things were already in there. This was like a fresh canvas, I could set it up how every I wanted too. I knew that the potting bench was going to go under the window. This is to the left of the door as you walk in. From there I decided to put the shelves along the left wall beside the bench. This would come in handy to put all of the gardening supplies, like grass seed, fertilizer, pots, sprinklers, etc. If you are wondering, I did fit everything back into my shed and have plenty of room left over for more stuff. I hope you find this article informative and helpful. 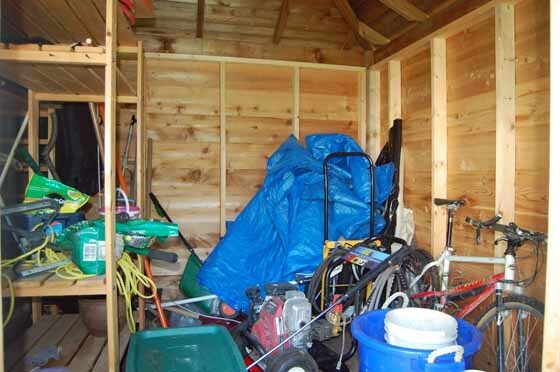 Please leave a comment below if you have any other garden shed organizing ideas that you would like to share with other gardeners.